Last month we posted a video for Morning Grain Bowls (https://nutritionfacts.org/video/recipe-morning-grain-bowls) from the How Not to Die Cookbook, and people loved it so we are bringing you another one of Wendy and Eric’s videos today (http://livelydays.com). We all know the standard avocado guacamole, and adding edamame kicks it up a nutritional notch. Make this snack and check off a serving of beans and vegetables on your Daily Dozen Checklist (https://nutritionfacts.org/daily-dozen-challenge)! Get the written recipe here: Edamame Guacamole (https://nutritionfacts.org/recipe/edamame-guacamole). Have a question about this video? 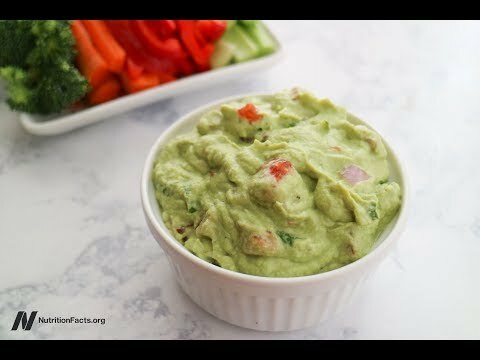 Leave it in the comment section at http://nutritionfacts.org/video/recipe-edamame-guacamole and someone on the NutritionFacts.org team will try to answer it.